"He's a wise soul. You peer into his eyes, and you can see that there's a lot going on in there." The newly-born calico kitten was found cowering underneath a staircase at Camden Apartments five years ago by the pub's owner, Eric Schiller. Although he was at that time an acknowledged ailurophobe, Schiller nonetheless immediately recognized Tanker Ray's potential as a mouser. He therefore took the hungry and frightened kitten and installed him as head mouser at the bar he and his wife, Shere, had recently opened. Tanker Ray grew strong and soon made short work of the pub's mice and lizards. That, however, was only the first of many benefits that Schiller has reaped as the result of his initial act of kindness. Tanker Ray soon became a favorite of the bar's patrons and his fame rapidly spread throughout the Tampa-St. Petersburg area and indeed around the globe. In addition to charming imbibers, he regularly appears at parties and fundraisers and even has been featured in a commercial for Ferman Automotive. 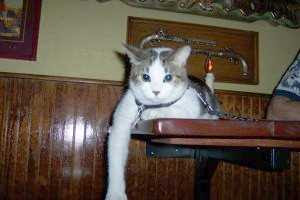 After he was named one of the world's most famous felines by Flippy's Cat Page, tourists from as faraway as London began asking for him immediately upon their arrival at the bar. Although he appears to fear no one, the affable twelve-pound cat is said to be especially fond of the tender gender and is not the least bit shy about posing for photographs. Like all cats, he has a marked disdain for loud noises whether they are emanating from drunks, dogs, motorcycles, or garbage trucks. Whereas most felines are repulsed by the smell of beer, Tanker Ray is said to have acquired a fondness for it by lapping it up off of the floor. Whereas all alcohol is most certainly detrimental to feline health, this has not stopped Schiller from christening Gaspar's signature red lager as Tanker Ray's Bar Cat Beer. Back in October, the cat became inexplicably ill, however. He stopped eating, grooming himself, and chasing mice. About all that he was good for was staring at the four walls and moaning. 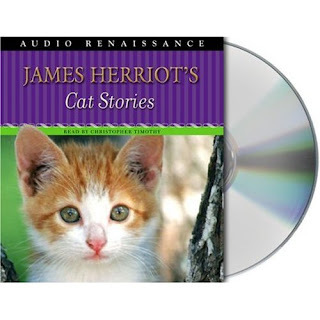 As still another testimony to the transformative power of cats, the former cat-hater became distraught himself. "I went ballistic," Schiller told the St. Petersburg Times on November 2nd. 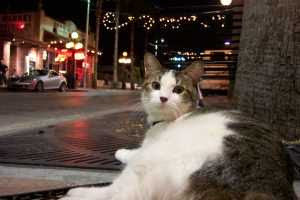 (See "After Weeklong Funk, Cat Back at Bar Scene.") "I told my wife, 'We're going to have to close the bar'." As the story goes, Alfred would sit unobtrusively at the end of the counter taking in his owner's every utterance and gesture as well as nodding agreeably at the conclusion of each sale. For instance, when Hatfield would look skyward as if he were calling upon the heavens for divine guidance in selecting the most appropriate confection for a discriminating customer, Alfred would do likewise. All of this just goes to show that, contrary to popular opinion, many cats do have good heads for business. The only reason that they are not titans of industry is that, like the presocratic philosopher Thales, they have far better things to do with their time than to engage in such destructive silliness. To make a long story short, one day Alfred, like Tanker Ray, became inexplicably ill and Dr. Herriot was unable for the life of him to ascertain what was ailing him. Hatfield therefore lost all interest in his business and would do little more than grunt whenever his female patrons stopped by expecting another Academy Award winning performance from him. Realizing that the confectioner's business was slowly going down the tubes, Dr. Herriot was forced to rack his brain in order to determine what was wrong with Alfred. Luckily, he was ultimately successful in his endeavors and the cat recovered. When he stopped by the candy store sometime later, Herriot was relieved to see that everything was back to normal. Hatfield was once again sweet-talking the old biddies out of their money while Alfred was nodding approvingly from the end of the counter. In Tanker Ray's case, Schiller at first thought that he had contracted the Feline Leukemia Virus (FeLV) but medical tests proved that was not the case. It was next suspected that Tanker Ray might be depressed by the Schillers' recent adoption of a kitten named Cargo. Although the cause of his malaise was never pinpointed, Tanker Ray recovered on his own in about a week and was even well enough to put in an appearance at a recent fundraiser for the Tampa Historical Society. "Luckily, nobody said to me, 'It's only a cat'," Schiller told the St. Petersburg Times. For the time being, Tanker Ray lives above the bar on the vacant second floor and makes his way downstairs through a specially constructed tunnel. When he dies, however, Schiller plans on taking his corpse to a taxidermist and then displaying the stuffed product on one of the bar's walls. That is sheer barbarism! For all the love and companionship that Tanker Ray has given him, not to mention the shekels that he has put in his coffers, the very least that he deserves is a dignified burial. Violating the sanctity of his corpse is senseless when photographs will serve the purpose just as well if indeed not better. "He's like a wise soul. You peer into his eyes, and you can see that there's a lot going on in there," Schiller told the Times in the article cited supra. If he truly believes that, he then also knows that Tanker Ray would not want to be eviscerated and stuffed. Photos: St. Petersburg Times (Tanker Ray) and Amazon (Cat Stories).